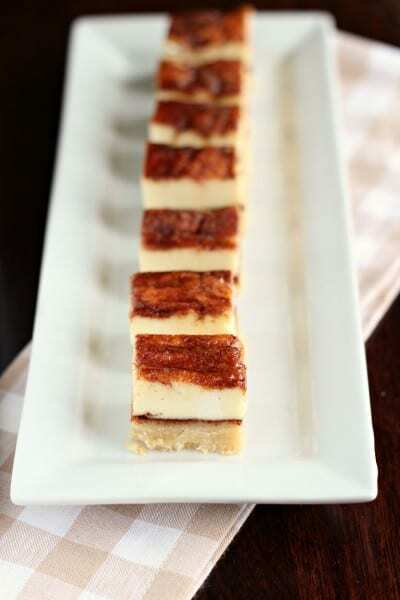 Churros cheesecake bars have a shortbread crust with a cheesecake filling. Bite-sized squares make this dessert easy to serve to a crowd. The line between cookies and bars is blurred this month in the most delicious way as the #CreativeCookieExchange is sharing treats today along the theme of Layered Bar Cookies. Is it a bar or is it a cookie? Guess what? It doesn’t matter what you call these beauties, just enjoy them! My assignment for book club recently was to bring desserts along a Mexican fiesta theme for a friend’s birthday. I started with these celebratory margarita cupcakes from the blog, Brown Eyed Baker. Oh so good! My next thought was to bring churros along but fresh churros are best eaten right away and I needed a dessert that I could make ahead of time. Enter these tasty layered creations: the Churros Cheesecake Bars. A quick google search proved that my idea was not an original one, the concept of incorporating cheesecake and churros’ flavors had been done before. I made these my own by combining a few recipes and a few ideas and the outcome was really a joy to share with my friends. Looking for more cheesecake recipes? Try this no bake chocolate chip cookie dough dip, ginger cherry cheesecake squares, and no bake cheesecake bites. How did my layer bars come together? 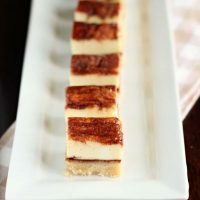 The cheesecake layer recipe hails from Joyful Momma’s Kitchen; her churro cheesecake bars look like they could have won a Pillsbury recipe contest as she delicately created layers with their refrigerated crescent rolls. Wow. Really something! The base of my bars is a shortbread crust since I didn’t have crescent rolls on hand. I had previous success with this shortbread crust from Sunset’s caramel-chocolate shortbread bars and the recipe served me well again. I added a bit of cinnamon sugar in between layers and my churros cheesecake bars were a success! 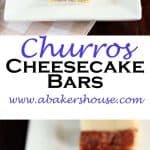 Churros cheesecake bars have a shortbread crust with a cheesecake filling. Bite-sized squares make this dessert easy to serve to a crowd. Preheat the oven to 325 degrees F. Line a 9 by 13 pan with parchment. In a food processor combine the 1 1/2 cups butter, 2 1/2 cups flower, 1 cup sugar and 2 Tablespoons cornstarch. Pulse until the dough comes together nearly in a ball. Press the dough into the prepared pan and bake for 25 minute or until the edges just begin to brown. Remove from the oven and let cool for 5-10 minutes. Mix the cinnamon sugar in a small bowl. Use about half of the mixture to top the shortbread. The shortbread will not be cooled yet-- that is fine and even helpful because the cinnamon sugar layer will melt into it and adhere more easily. Set the remaining cinnamon-sugar mixture aside. Now create the cheesecake layer: with an electric mixer or a stand mixer, beat the cream cheese and sugar until smooth then add in the egg and vanilla. Make sure your egg is at room temperature before adding or else your mixture will break apart and appear to curdle. Pour the smooth cheesecake mixture into the pan. It may be easier to scoop out the mixture and to place small lumps of it over the pan then use a spatula to even out the layer. Top the bars with the remaining cinnamon sugar to completely cover the cheesecake layer. Bake at 325 for 35-40 minutes. Let cool completely then refrigerate before cutting and serving. The cheesecake layer for these bars is from the site Joyful Momma's Kitchen found here and the shortbread layer was originally found in this recipe from Sunset Magazine. We’d love for you to join the #CreativeCookieExchange. The theme this month is Layered Bar Cookies–any kind of cookie or bar that shows off layers of goodness! If you are a blogger and want to join in the fun, contact Laura at thespicedlife @gmail.com and she will get you added to our Facebook group, where we discuss our cookies and share links. Ah, I was waiting for this one, Holly! Love that you combined churros and cheesecake for the perfect fusion dessert! Thanks, Stacy! I like the idea of making this as a full-fledged cheesecake but these bite-sized portions are hard to resist too. I really like what the group baked this month. When can we meet and can you bring some of these? But seriously…time for coffee soon right? These do look fantastic! Now that is a good idea, Barb! I Would have loved to have shared these with you. Another time. Yes, coffee soon would be great. Let me know when you are free. Holly, these look luscious. I love churros, so anything that reminds me of churros is great! And I bet these are! Plus a little cheese is good, too! You are right, Abbe, you cannot go wrong with cream cheese! Now I need to find time to make the real thing and try churros at home. These look divine! I was looking forward to these. SO interesting and good looking cookie bars. Thanks, Ansh! I will definitely make these again. Wow, Holly, amazing layers, and such creativity! They look fantastic!!! What a fantastic blend of flavors! Love churros but know what you mean about eating them while they are fresh. I will take these in place of them any day. Can’t wait to try them! You had me at churros! These delightful bars look positively delish … they are going on my to-make list ASAP! Thanks, Kimberly! I found a lot of recipes for bars this month that I’ll keep on my short list of must-bakes. These look ridiculously, outrageously, must-have-some-NOW good! I love churros, I love cheesecake…so churro cheesecake bars are right up my alley. Thanks for these! Thanks, Robin, it is hard to go wrong with cheesecake and these churros cheesecake bars were a good combination! I first discovered sopapilla cheesecake many years ago at a funeral luncheon and instantly fell in love. I tracked down the baker and got the recipe and must have made them a hundred times before getting a bit burned out. I haven’t made them in years. I am so glad to see that you have an updated version of this old recipe. My interest is renewed in them. I can’t wait to try this Holly. They look delicious. Yum, a sopapilla cheesecake sounds divine. 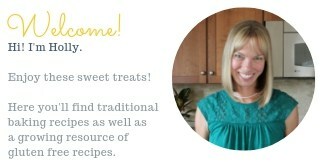 Is the recipe on your blog? I’ll have to check it out. Great minds think alike! And since my caramel bars are gone now I really want one of yours!